#01 2017/02/08 - Bon Secours Wellness Arena, Greenville, South Carolina, USA - bjtourss Webseite! The first tour to be started without Richie Sambora, who left the band after the first leg of the What About Now Tour in 2013. 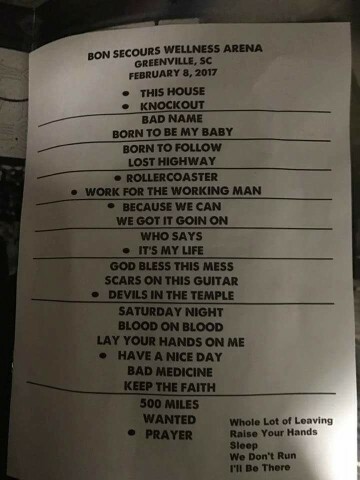 So the first show of the tour with many songs from This House Is Not For Sale played, as expected. 6 new songs were played. Always as the first encore. A song nobody would have expected after his voice-crisis since the second half of the Because We Can Tour. During the show Jon talked about working on his voice and that his goal was to sing Always the first show. Although it was far from perfect he did a pretty decent job for todays' standards. Audibles on the setlist were Whole Lot Of Leaving, I'll Be There For You, Raise Your Hands, I'll Sleep When I'm Dead and We Don't Run.